This time of the year, I get to spend a little more time watching T.V. Since it gets dark so much earlier and it’s pretty chilly out, makes bundling up and catching up a very fun thing to do. Over the last couple of months, I’ve been sharing my experiences with Contour by Cox with you. Today is my final post and I want to play catch up on how things went. Plus, you know I’ll be sharing a fun and easy T.V. time snack idea with you, it typical Homemaking Hacks style. I am a member of Everywhere Society and a Cox Communications’ brand ambassador reviewing Contour by Cox. Everywhere and Cox Communications have provided me with compensation and a 6-month trial of Contour in exchange for my coverage of this product. However, all thoughts and opinions expressed herein are my own. When we upgraded to Contour App , we also gained the ability to be able to record shows. It has to be the best feature for us, allowing us to never miss a show. Matter of fact, just yesterday we had plans for an early Thanksgiving with my parents since they will be away on the actual holiday. Normally that would have made me crazy because our favorite football team was scheduled to play exactly when we were going to be arriving at their house. It was SUCH a relief to be able to set our game to record so that we could watch it whenever we wanted. Really big game changer. Pun intended! Let’s go over some of the awesome features to recap! The Contour Guide is a highly modernized guide that’s easy to navigate. It has a recommendation engine that will suggest things to watched based on your actual viewing habits! Neato! There is a Contour App that you can download on select tablets and iPads. This can give you convenience and the ultimate personalized experience all in one. You can log in to your own account to get your very own recommendations right on your device. You can also set the DVR features directly though the app. TV Just for Me? Check! As I mentioned earlier, the DVR capabilities rock. You can store up to 1000 shows and have up to 8 household viewer profiles. Totally user friendly too! 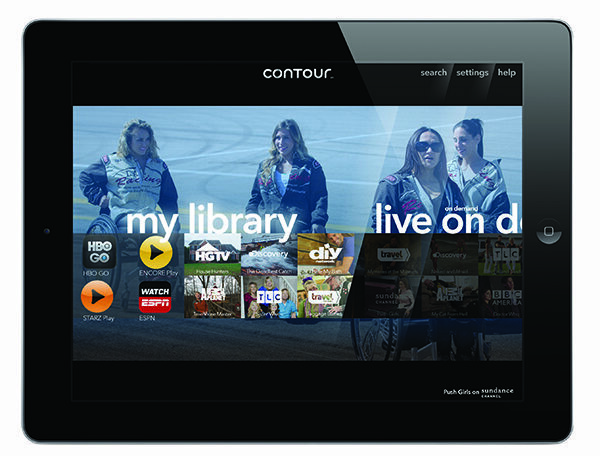 => See how I’ll never miss a show again and what I thought about Contour by Cox in the first few weeks here. All in all, I’m impressed with the whole experience. It really feels like an asset in this modern world with everything moving so fast and with a busy lifestyle. I like to treat myself to a little T.V. time, but I like that I can do it on my terms now. Miss a show? No big deal, I can record it to watch when I want. Have nothing to watch? Get personalized recommendations! I really hate wasting time scrolling through channels hoping to find something to watch, these features are really perfect for busy people like myself. To be honest, I don’t think I could go back to not having it. I am fairly sure we’ll be keeping the service after my trial. I think it will be easy to convince my hubby on this one. Now before I run off to watch some of the shows I’ve recorded, let me share my quick and easy snack that’s perfect for a little show marathon. Mix all ingredients together and toss to coat. Spread mix on a parchment paper lined baking sheet. Bake at 300° F for about 25 minutes. Making sure to flip the mix over with a spatula once or twice while baking. Cool and serve. Store in an air tight container. So yummy and simple! Are you ready to make your T.V. work for you? What are your favorite features with Contour by Cox, being able to create a personal profile? Getting recommendations on what to watch or something else? This has my name all over it! Thanks for linking up with What's Cookin' Wednesday! Sounds like the perfect snack! Thanks for linking up with SNF! Pinned to our party board! Sounds like an interesting snack with a kick. I pretty much love anything with the buffalo flavor. That is a really cool feature from Cox. Oh la la! I love anything buffalo and so does hubby. Perfect for watching football! We don't have Cox here. :( But that Buffalo snack mix sounds awesome! The personal profile feature sounds super appealing! The snacks sound yummy too. This looks great and perfect for munching on during a football game. Now I want some. I will have to try this. This looks like a great TV service. I wish Cox was available in our area. That trail mix looks delicious. My kind of snack mix! Buffalo sauce is one of my faves! I love binge watching tv. I think my son would really enjoy the snack mix, he's a fan of all things spicy. I do love anything spicy. I'd love to give this one a try! I love nibbling on snacks when watching TV or movies at home. I'm not a fan of spicy, but The Hubs is - so this would be for him. I think it's neat that you can do things from your device and there is an app to make TV watching and recording that much easier. Great looking snack, too. Oh I love anything buffalo flavored. I will have to make this for my family for our next movie night! I'm a big snacker and I love stuff like this. I tend to snack when I'm working and when I'm watching a movie! Oh what a great idea! I love snack mixes, my husband does too especially for movies! This looks delicious. I like the idea of baking a snack in a casserole. Perfect snack to enjoy. Will try it. I like a little TV time too. I don't do it near enough though. 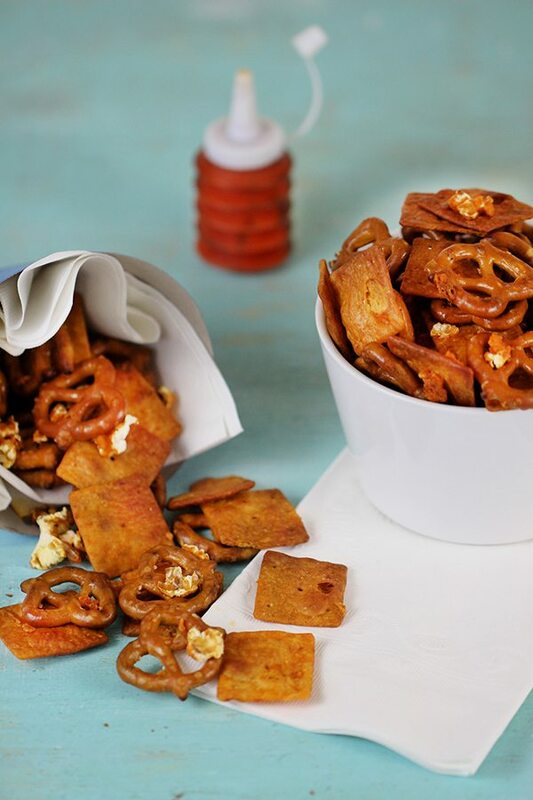 Thanks for the recipe - I am always looking for new snacks. My hubby is a snacker! This sounds really good. I love to snack on trail mix and popcorn while I catch up on my shows. I love snack mix! This sounds delicious! This looks like a great quick and delicious snack to have while watching TV. I wish we had Cox available in my area. Gotta have yummy munchies while catching up on my shows! This looks amazing too! 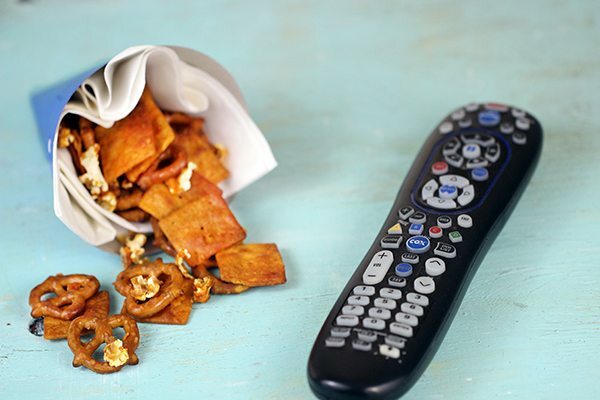 This sounds like the perfect snack for watching TV. I can't wait to give it a try. Girl, come on. Let's have a movie night and chat fest with this fiery goodness! YUMMY! This looks like a cool service. We have never had dvr (I know. Crazy.) We rely on a few apps to watch our tv shows. My hubby and I love to munch on stuff like that. I will have to give this a try!